Shhwonk Fortress is an underground fortress in Paper Mario: The Thousand-Year Door where the Moon Stone and the Sun Stone are kept. It is beyond Petalburg and a few smaller stone fortresses. The Stone Keys found inside are used to open the pipe to Hooktail Castle. Long ago, Shhwonk Fortress was a place of relief from monster invasions for Petalburg residents, but more recently it has been invaded by monsters and traversing to the ruins was recently outlawed without permission from Mayor Kroop. It is unknown when the fortress was built, but at least one of the fortresses located in the path to it is estimated by Goombella to be about a thousand years old. Before Mario was allowed entrance, he had to participate in a quiz show with a Thwomp guarding the pipe to enter. 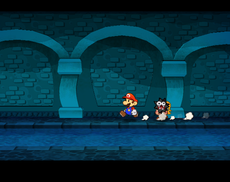 After passing the quiz, Mario was allowed entrance into the Fortress, which was teeming with Fuzzies. After collecting the Sun and Moon Stones, Mario had to fight a Gold Fuzzy and its Fuzzy Horde in order to get out. For enemy formations in Shhwonk Fortress, see here. Multibounce In the red ? block in the entrance screen underground. Sun Stone Two screen to the right of the entrance. Guarded by four Fuzzies. Moon Stone Two screen to the left of the entrance. Guarded by four Fuzzies. Sutton Toride "Sutton Fortress". Derived from the English word "stone" and an anagram of Thwomp's Japanese name, Dossun (ドッスン). This page was last edited on September 16, 2018, at 14:11.